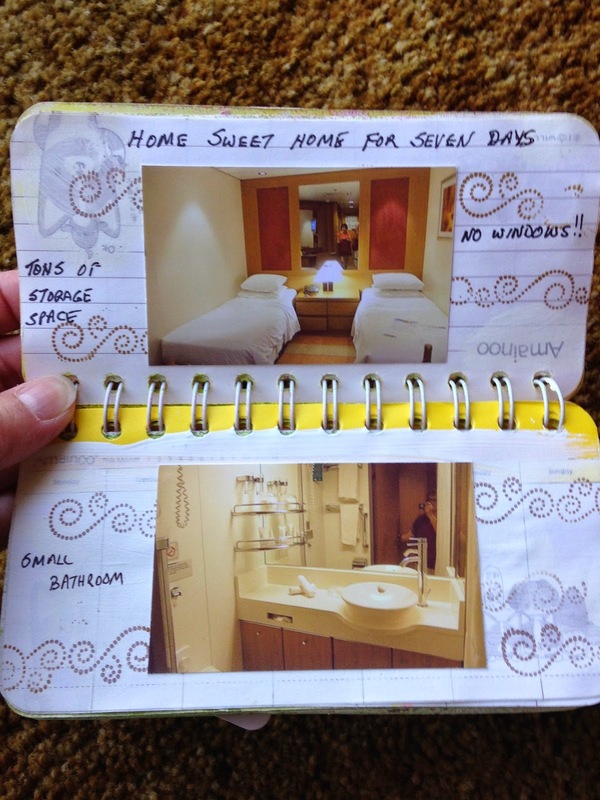 Thanks to Sharon K who had a wonderful tip she wanted to share with all of us which led to the making of this sweet mini album. 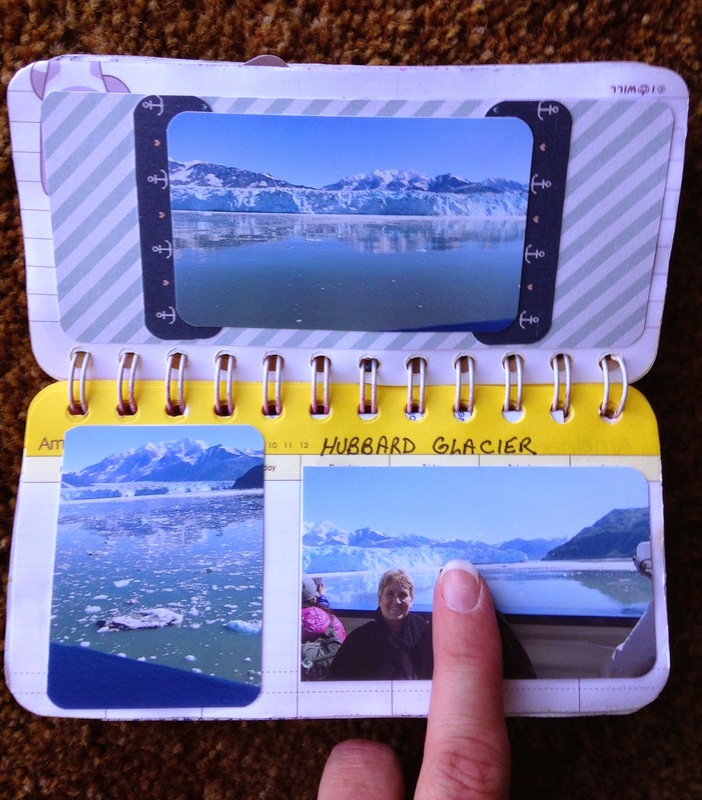 Sharon brought a compact photo printer on the cruise. Her printer is an HP which isn't manufactured anymore. However, Canon makes a photo printer called a Selphy 910 and Epson makes one called a PictureMate. 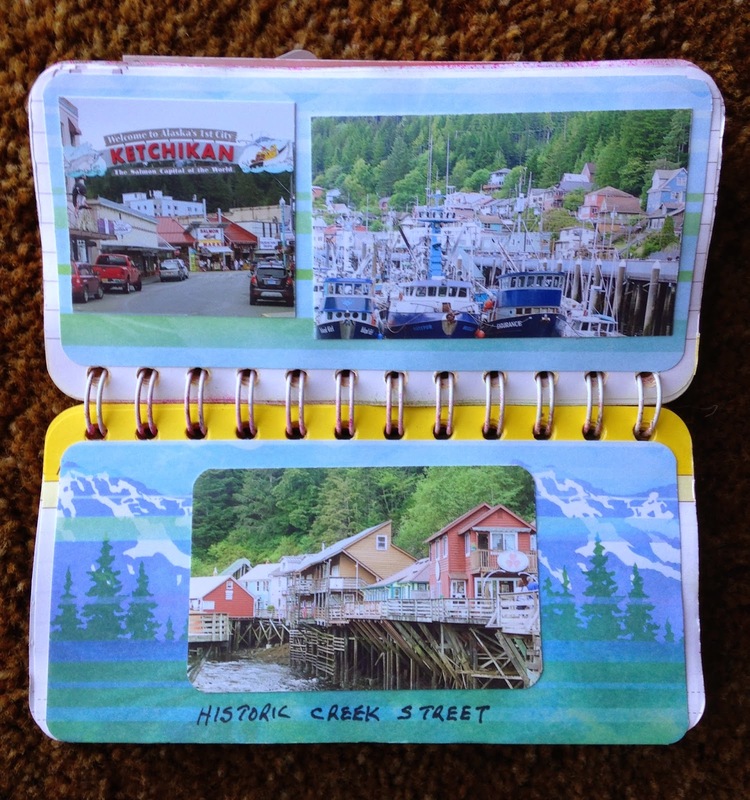 Each night after a fun filled day of cruising and cardmaking, Sharon would print her pictures and adhere them in a little blank journal. 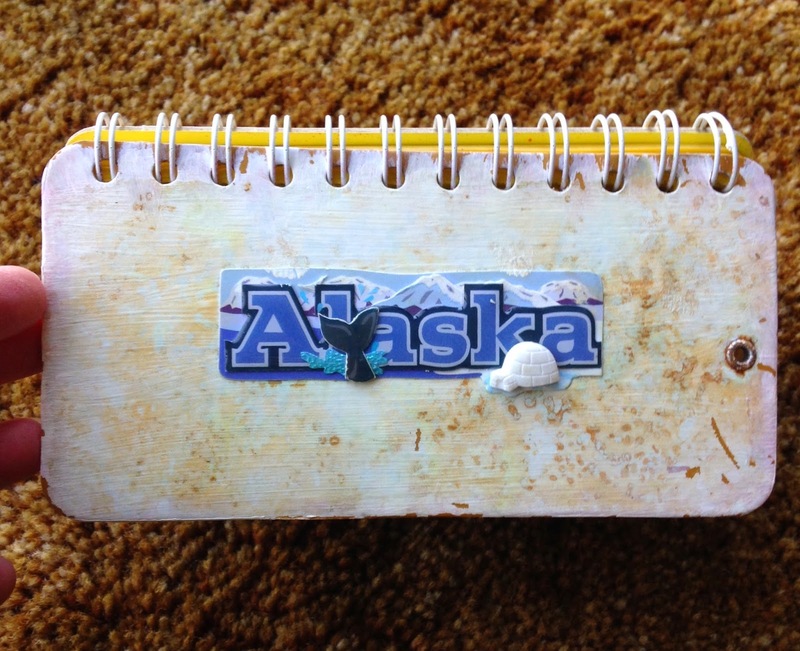 It looks like Sharon painted the pages with gesso to give them more strength. 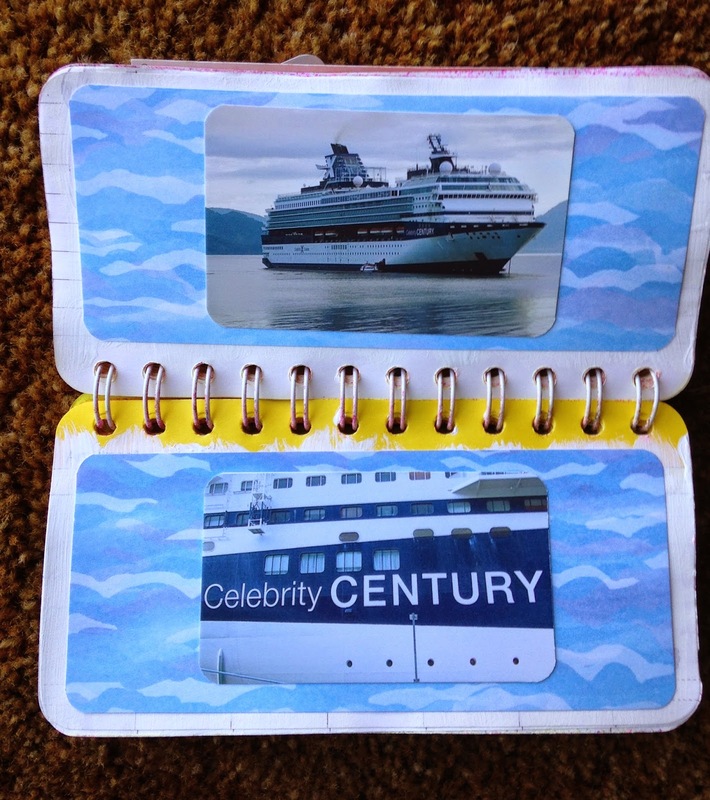 At the end of the cruise, Sharon had a completed mini album filled with memories of her wonderful trip. 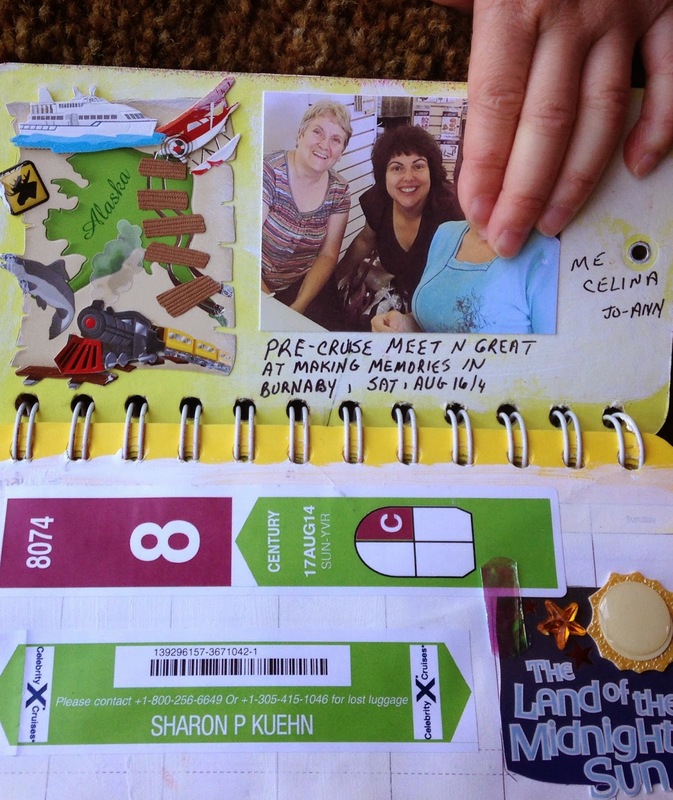 What an awesome idea Sharon! 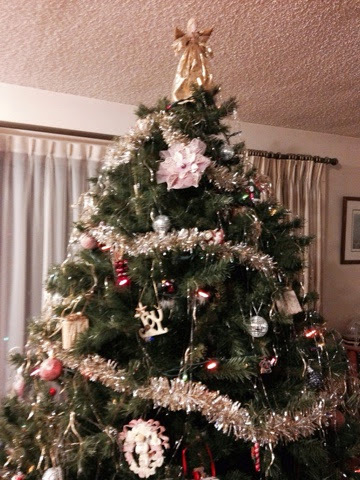 On behalf of Jessie, Donna and me, Celina, we would like to wish all of you a happy and safe Christmas. 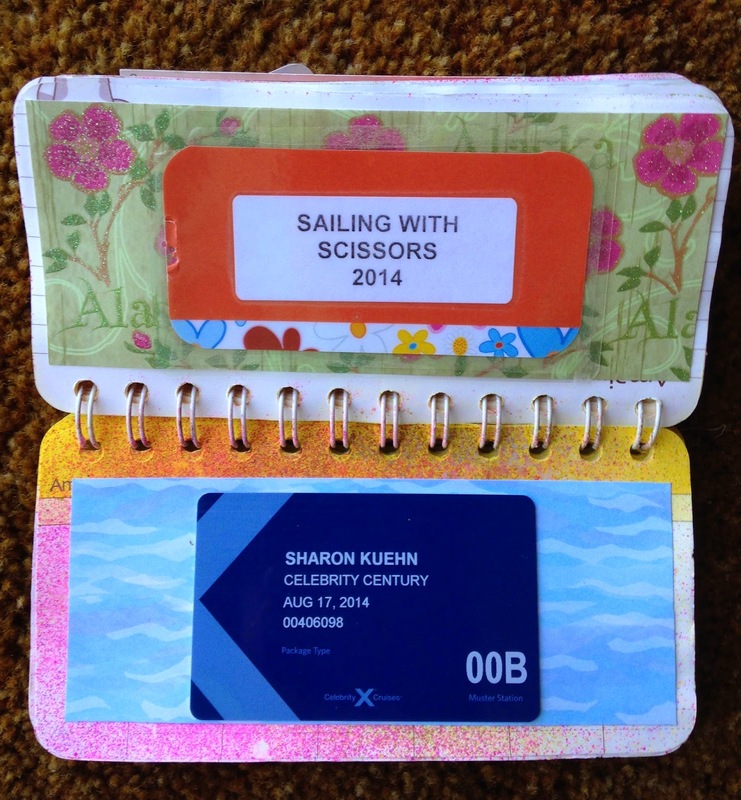 Thank you to our awesome Sailing with Scissors friends!! 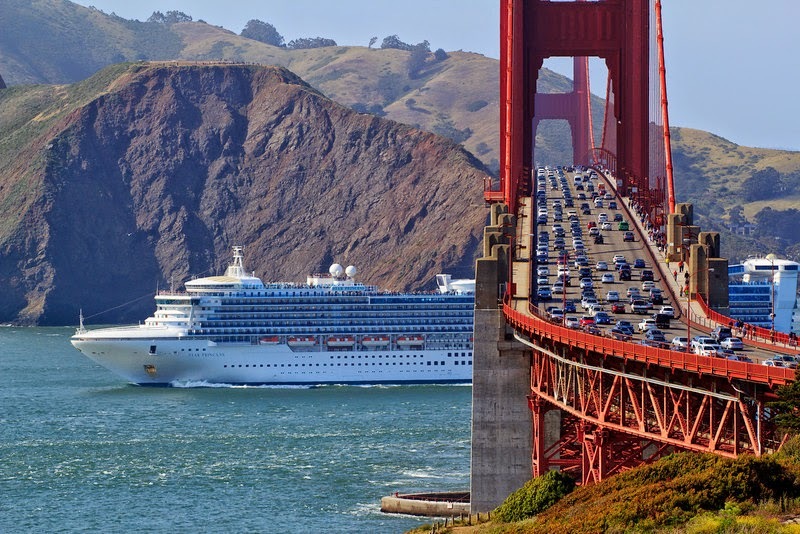 Our cruise ended a few months ago, and is a now a fond memory in our minds and our hearts. Sailing with Scissors could not have been possible without you, our guests, our members, our friends. The laughs, jokes and fun have put a smile on my face a few times since that fabulous event. 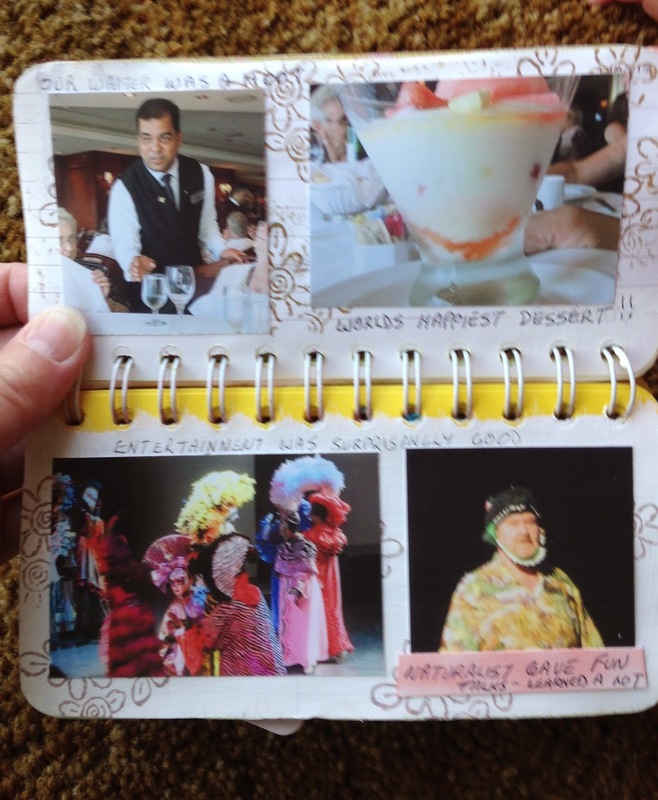 Someone, who all of you know, wanted to be referred to as "Princess" for a month after the cruise. I also can't serve The Princess black olives without remembering how everyone at my wonderful dinner table surrendered their olives and passed them to The Princess. I would like to thank all of you who kept an eye on The Princess for me as well as treat her to wonderful little gifts. She loved all of them. Thank you also for the help I received when I had the two days of motion sickness (the first time it had ever happened - ugh!!). Last but not least, I would like to thank everyone for the awesome card and gift. It was really special seeing all your kind words. It was very thoughtful of you. You are all awesome people! Thank you to our awesome sponsors!! Thank you very much to our wonderful sponsors. 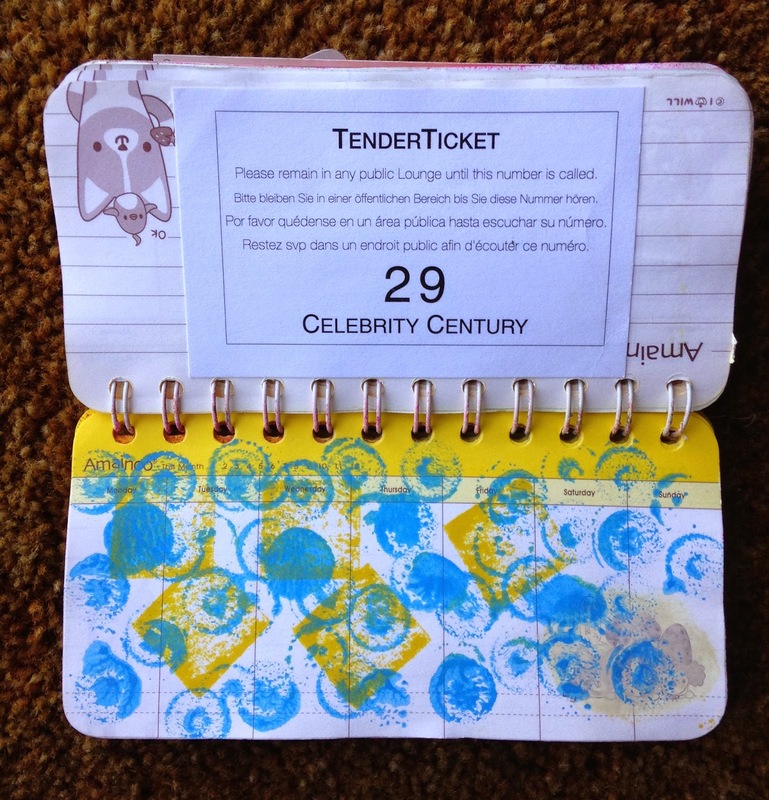 Without their generosity, our Sailing with Scissors event wouldn't have been as awesome. Thank you again everyone for your kind generosity. 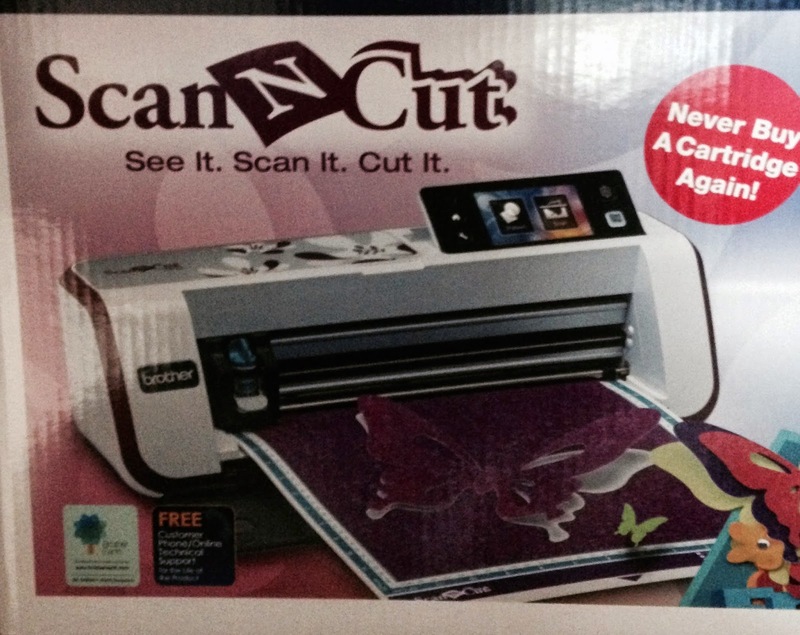 Congratulations to Mary Jo who won a shiny new Scan N Cut! 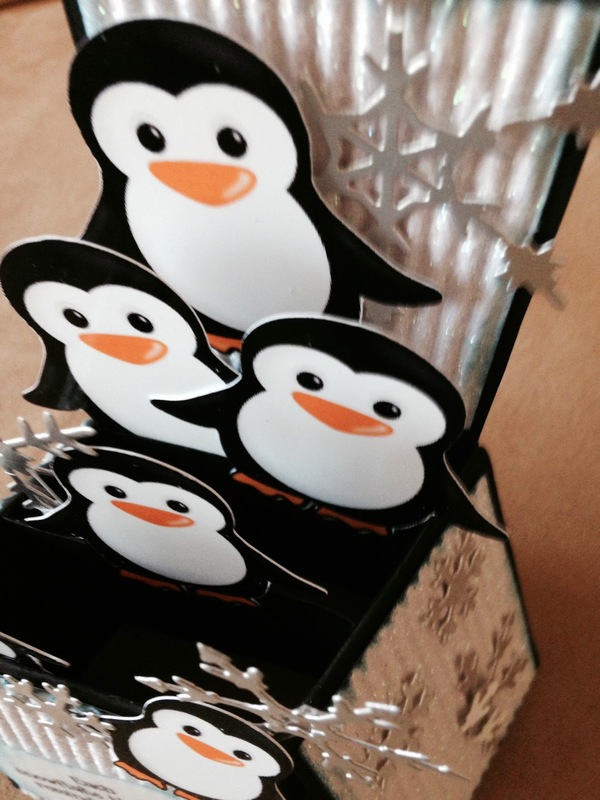 It is the best die cutting machine on the market. If you don't want to fiddle with computers and cartridges then this is the machine for you. I love my Scan N Cut. My favourite feature of this machine is that you can stamp an image, scan it into the Scan N Cut and it will "fussy cut" that image. 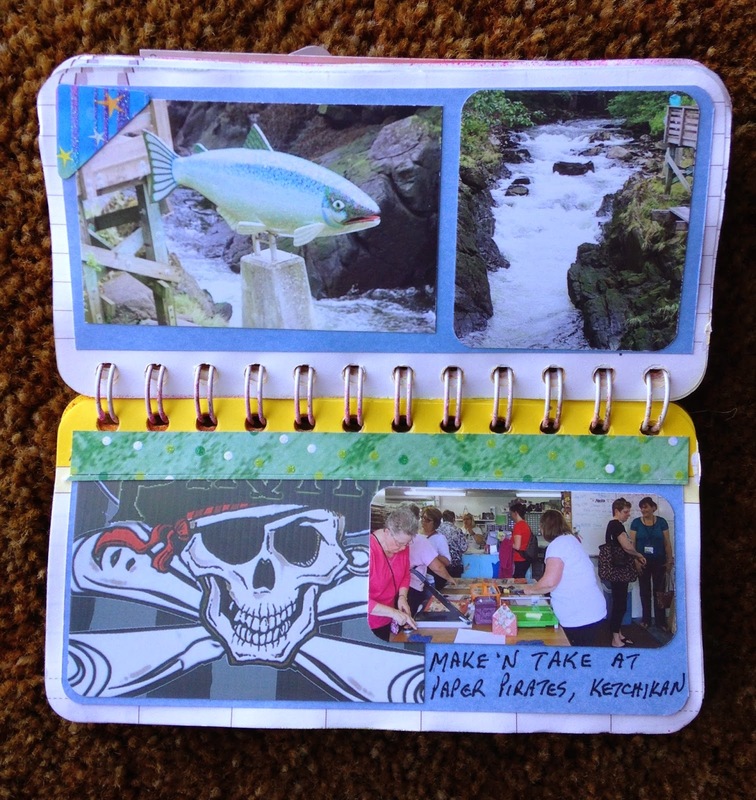 Thank you to Donna for arranging this wonderful prize for our Sailing with Scissors group. 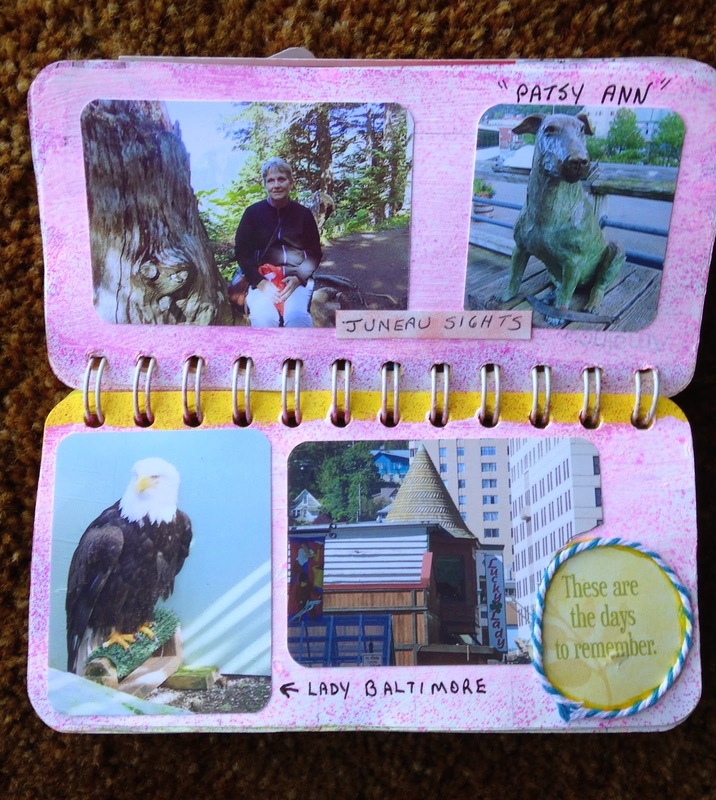 Mary Jo, you will have soooo much fun with the Scan N Cut. Thank you to Brother Canada for your generous donation of this incredible prize. 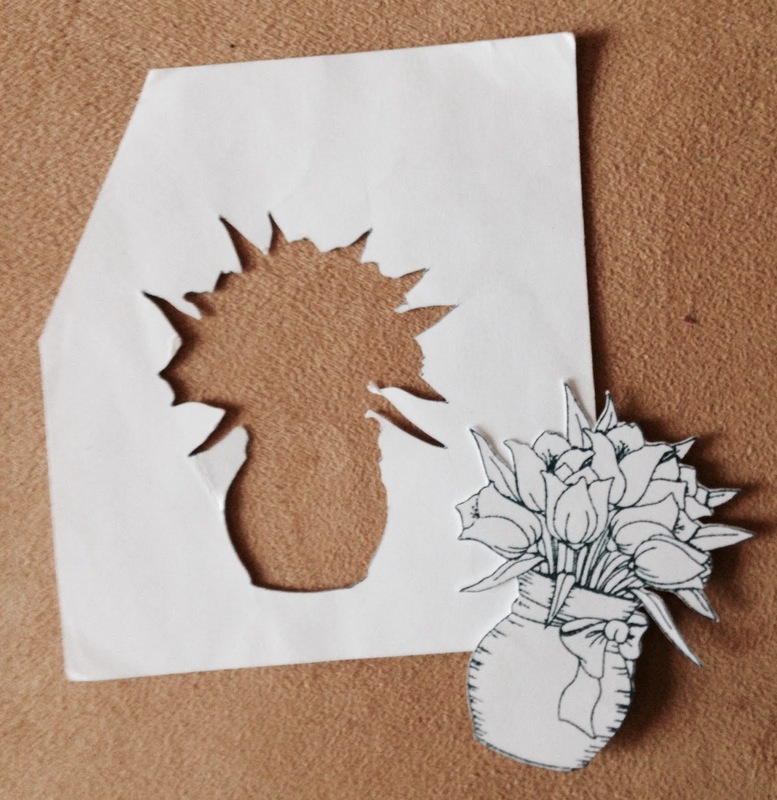 Look at this intricate fussy cutting! 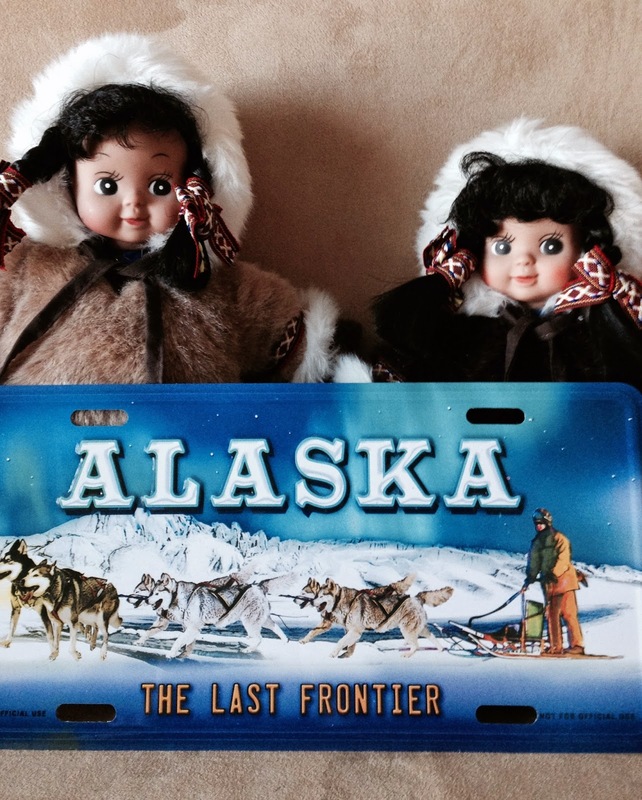 We received absolutely stunning cards for the Card Swap. 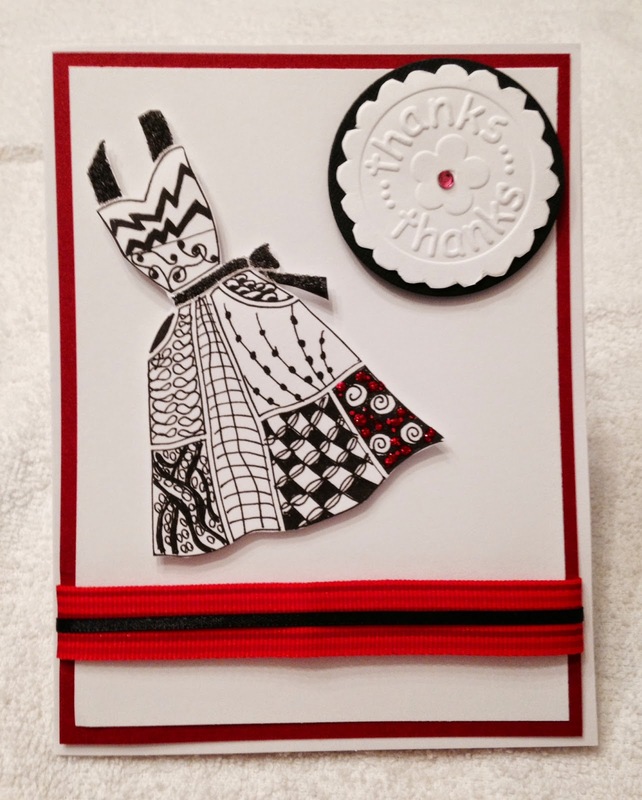 The variety of the cards were incredible from the simply elegant cards to the more elaborate cards. 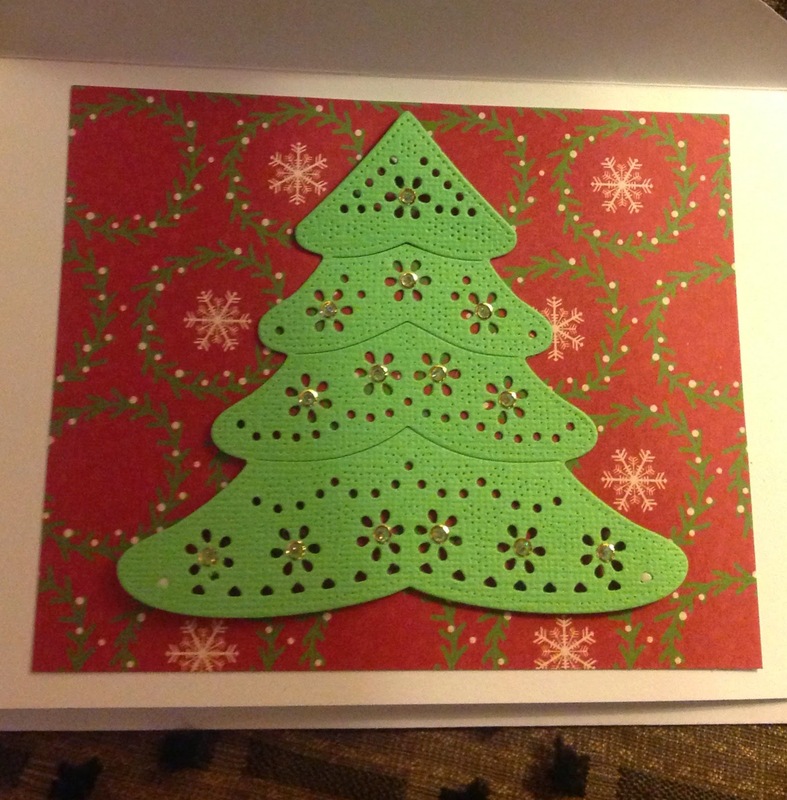 Thank you to everyone who participated in this fun event and took the time to make beautiful cards. The cards are not posted in any particular order. Please scroll down to the "older posts" page to view all the cards posted there, as well. 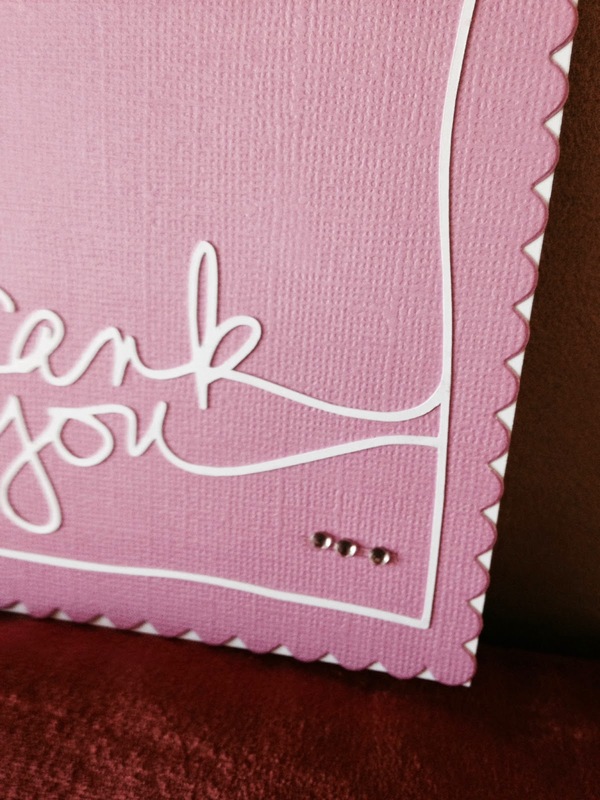 Awesome cards - give yourselves a pat on the back! 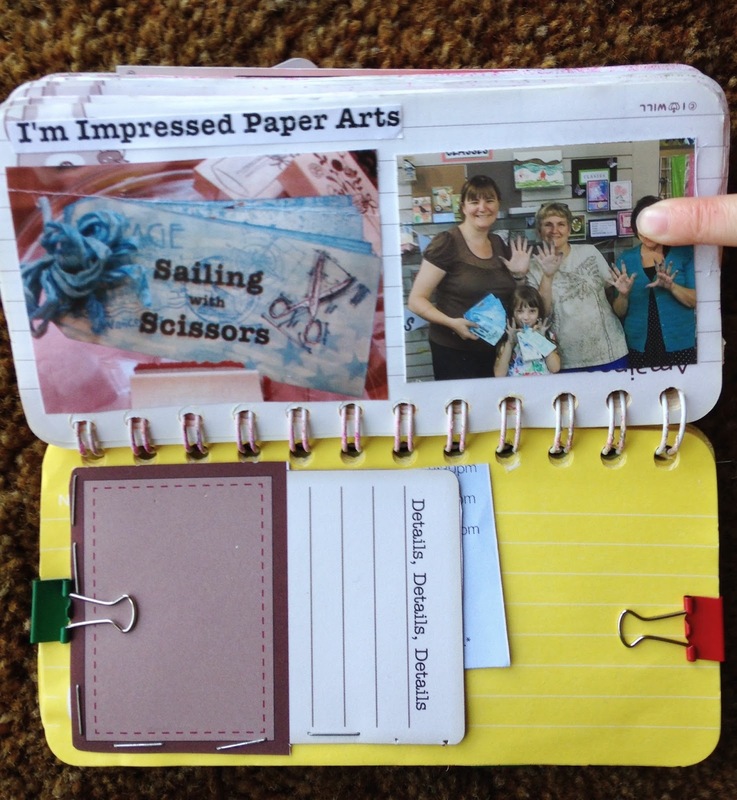 April made this incredible box card for the swap. April received a well deserved round of applause from all the other participants in the swap. 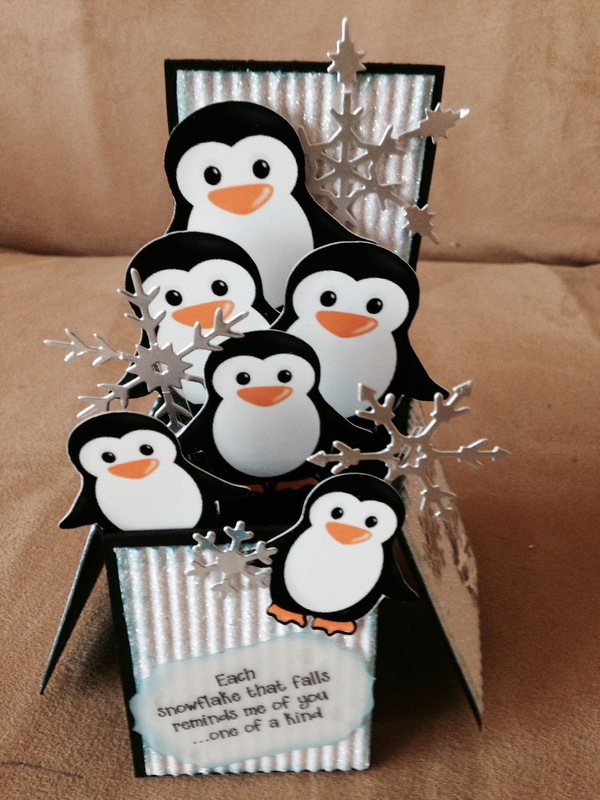 This is a beautiful card that she made on her Scan N Cut. 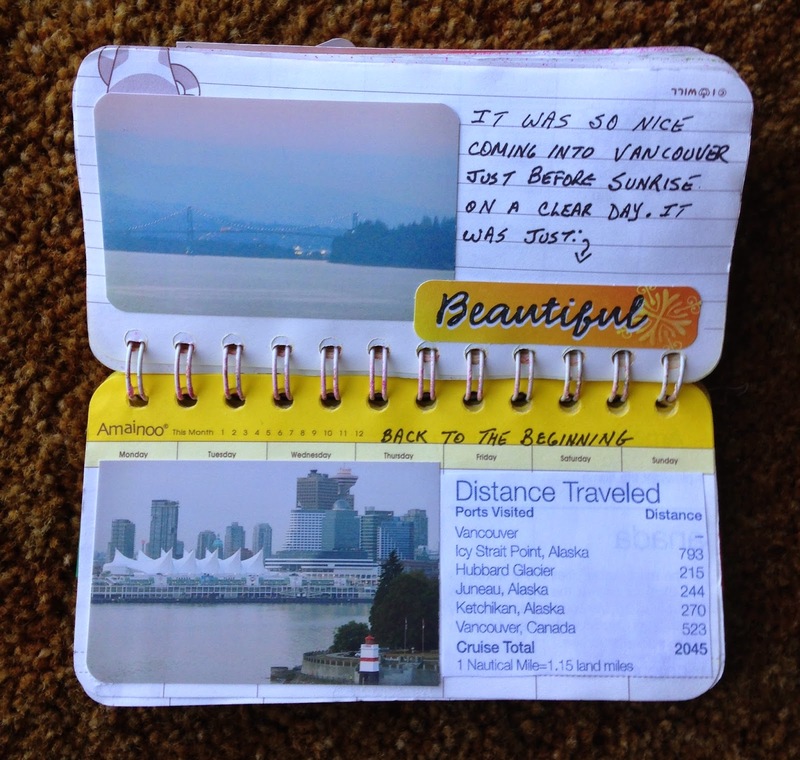 You can tell that April put lots and lots of time making her card. Thanks April for this breathtaking card. 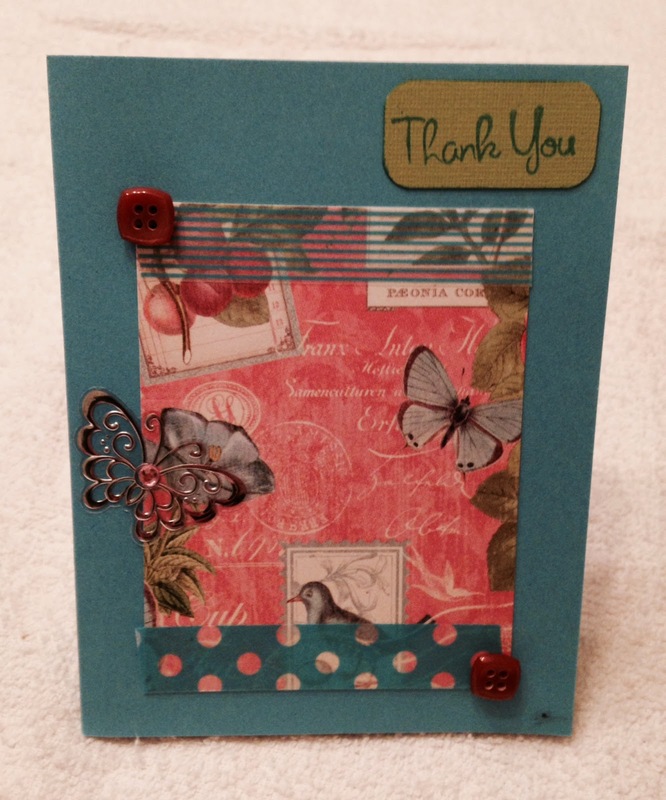 Lynette made this beautiful Trillium flower card for the swap. Would you believe that this is a one-layer card? 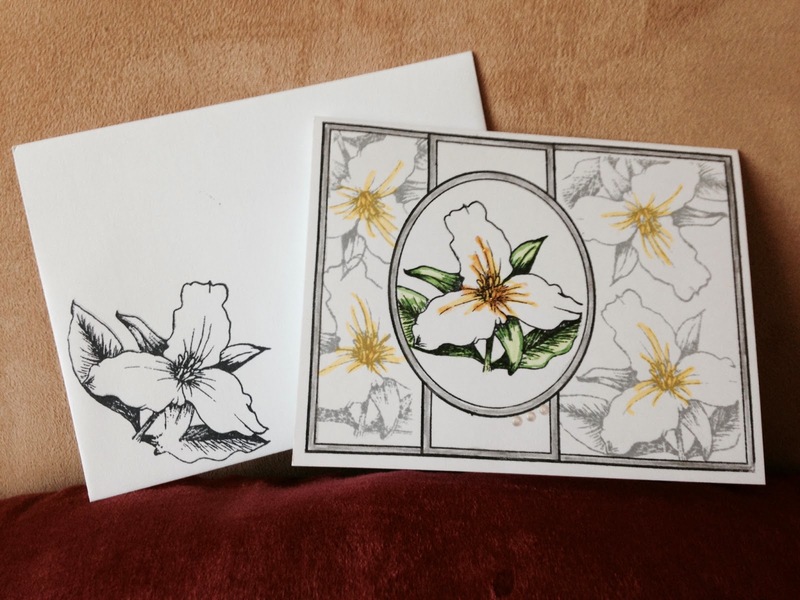 The shading, panels, and background Trilliums make this card pop off the cardstock. 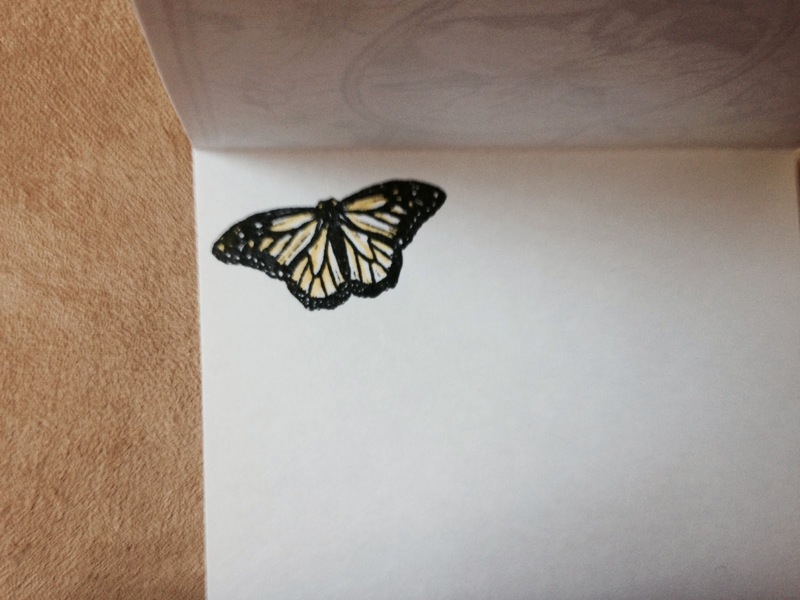 The stamped butterfly on the inside of the card is a nice touch, as well. Awesome card Lynette. 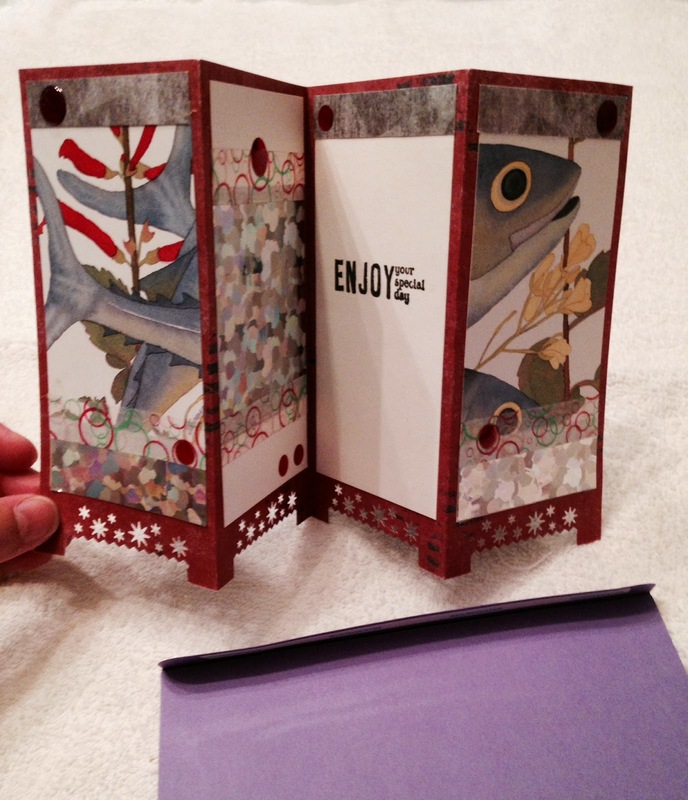 Beth made this blushing cherry blossom card. The shading and colouring are delicate and warm. 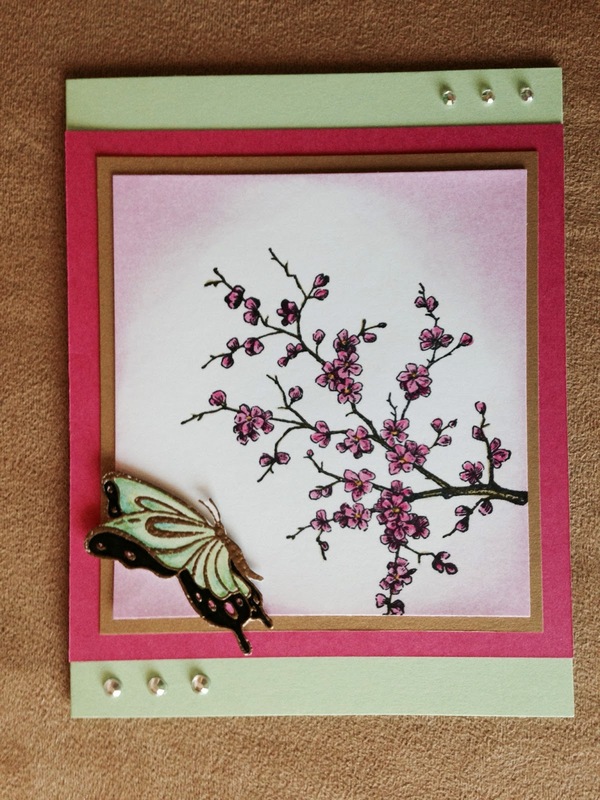 The popped up butterfly gives this pretty card added dimension. Great card Beth. 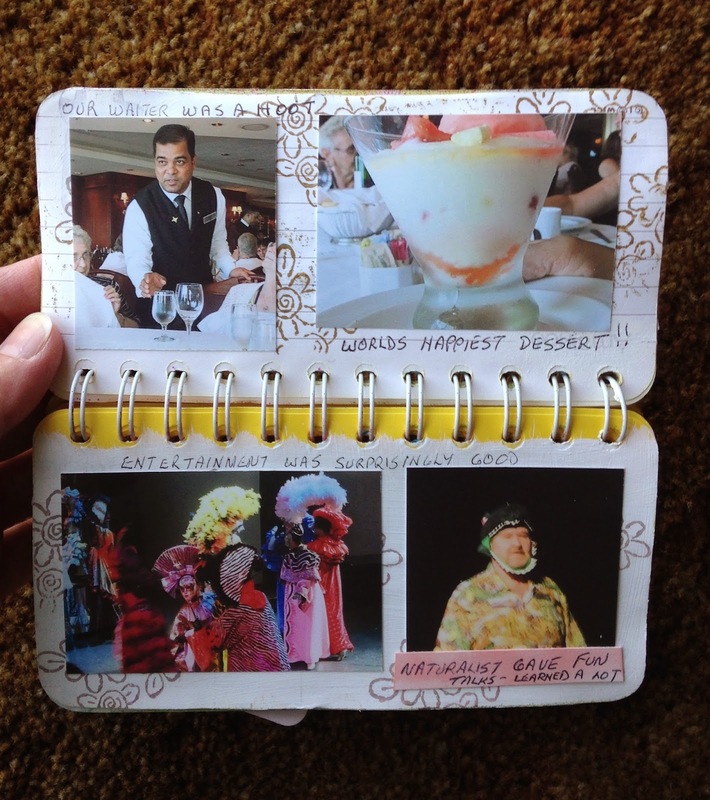 Sharon made this gorgeous collage card. 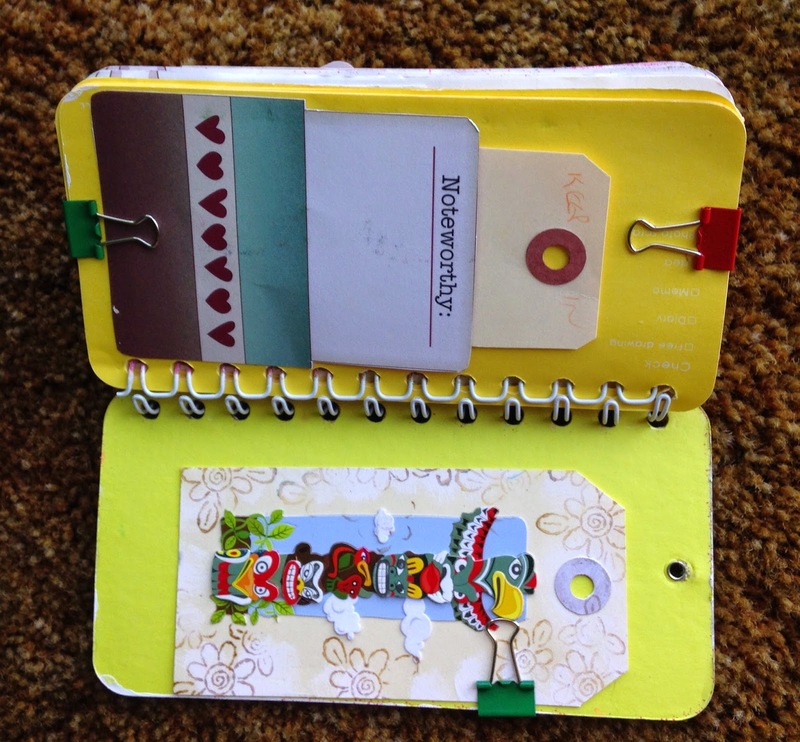 The decorative paper matches nicely with the washi tape, buttons and butterfly embellishment. 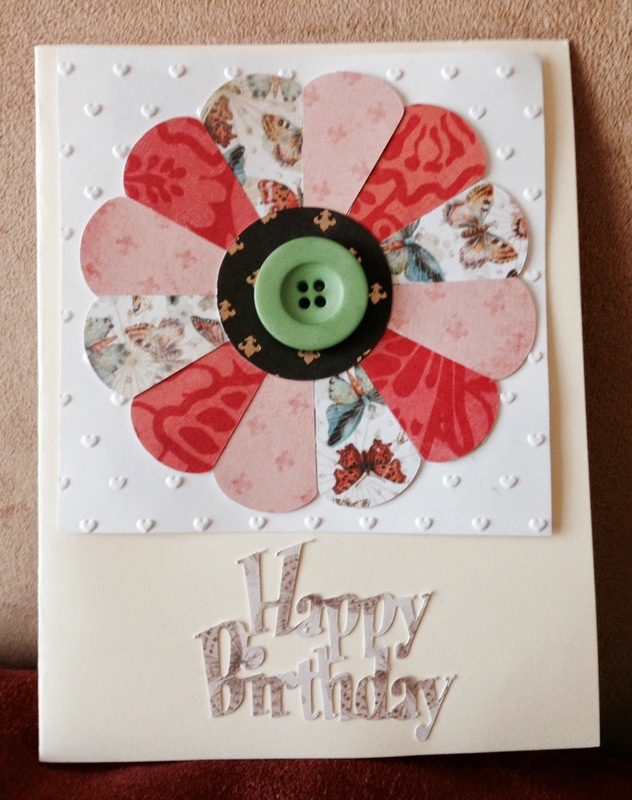 Great card design Sharon. 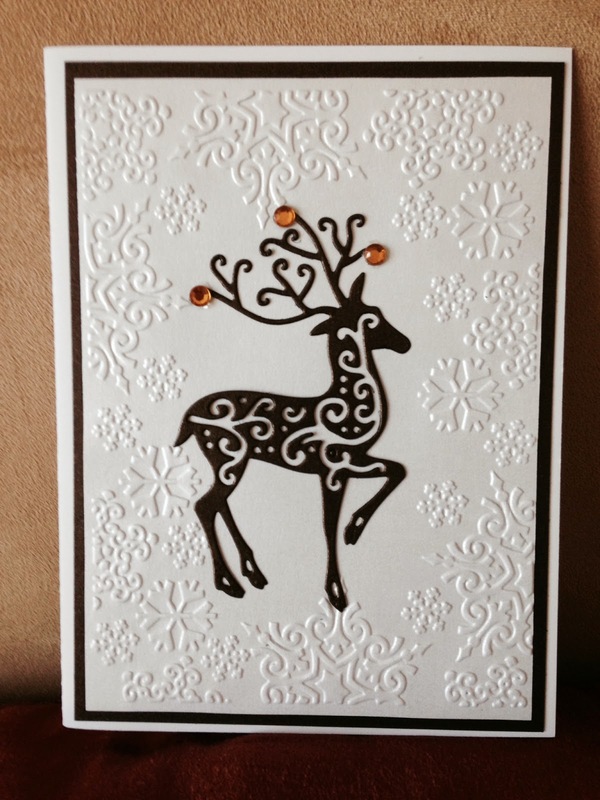 This is Linda B's folk art inspired card. 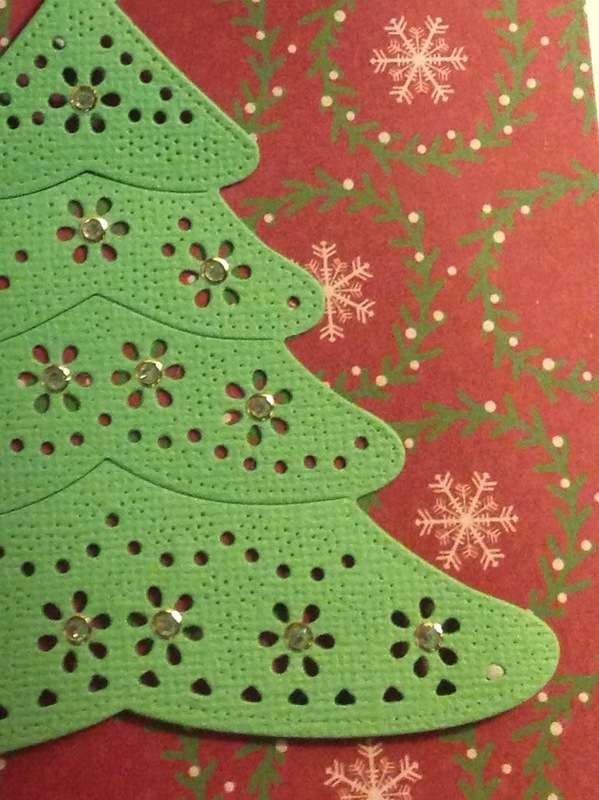 The detail on the lacy tree is lovely. It is reminiscent of a decoration you would find on a Christmas tree in Denmark or Switzerland. Beautiful card Linda. 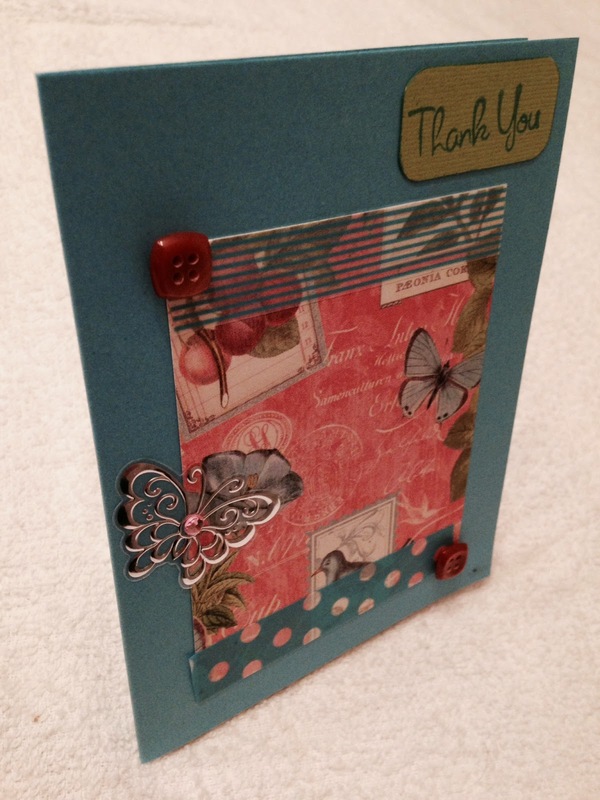 Jo-Ann made this rustic and dimensional card. The elements of this card are fabulous. 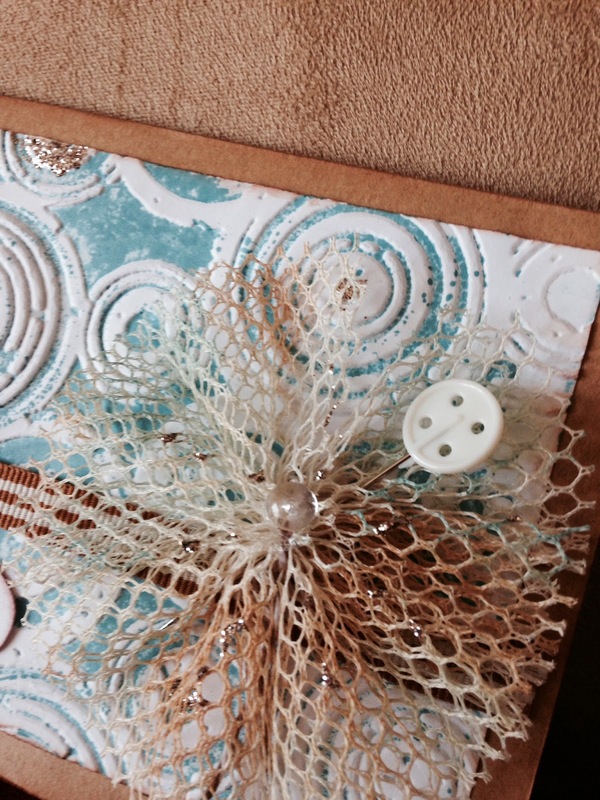 I love the netting with hints of glitter, the whimsical hat pin and the dew drop on this card. It makes for a really cool card. Great job Jo-Ann. Elizabeth made this pretty card. 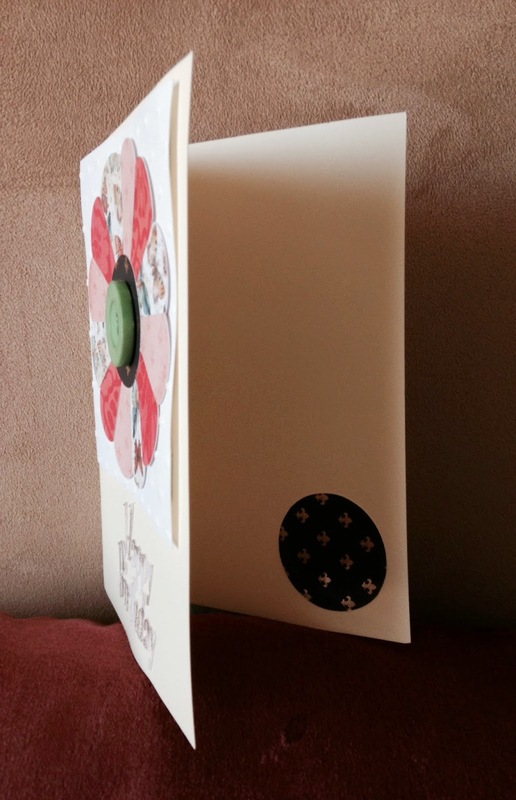 The minimalist design adds to the boldness and artistic design of the card. The hot pink, black and cream colours are a pleasing combination. Great job Elizabeth. 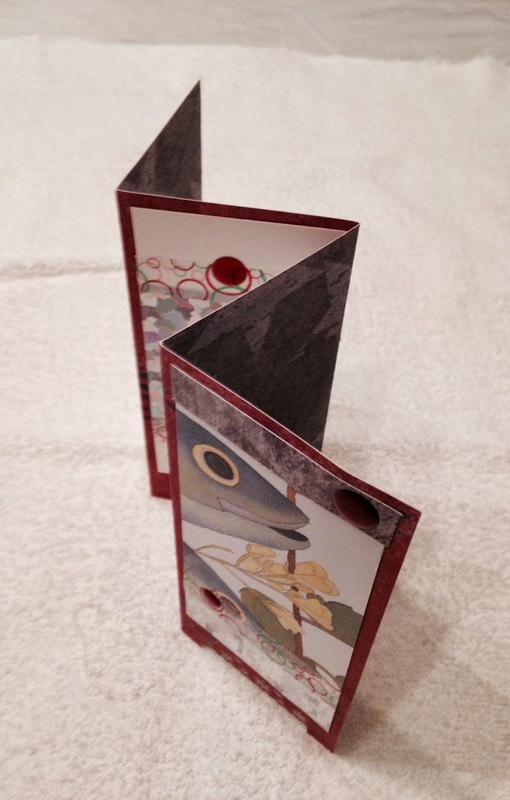 Ruth made this elegant shimmery card. 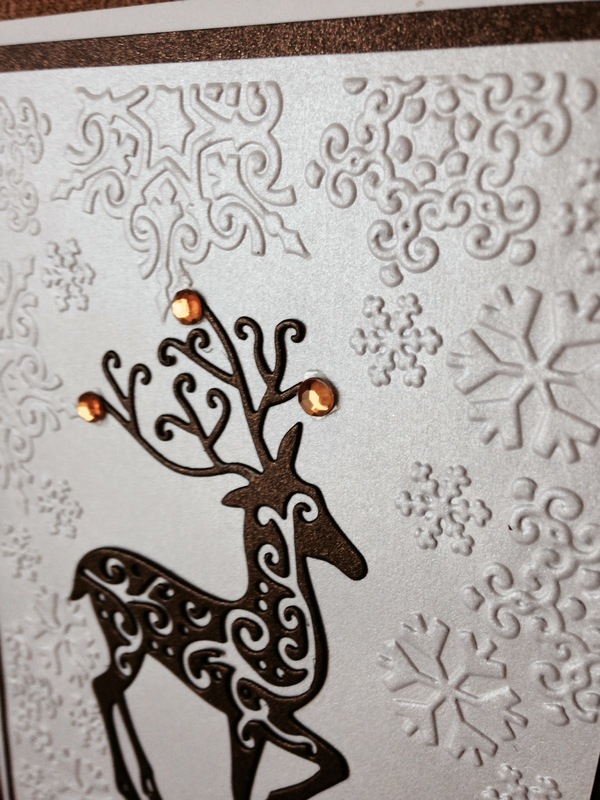 What a luxurious reindeer surrounded by a frame of falling snowflakes. 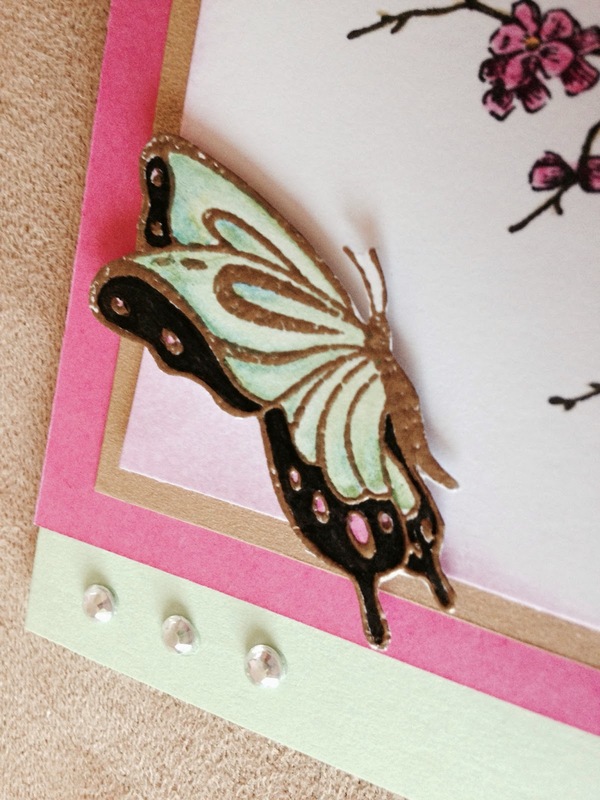 The gem embellishments add to the high-end look of this card. Awesome card Ruth. 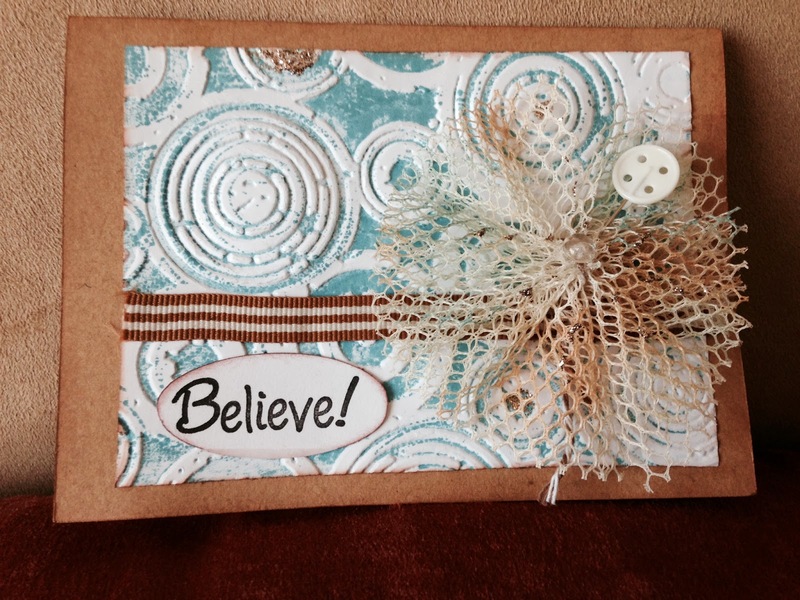 Annette created this light and airy card. 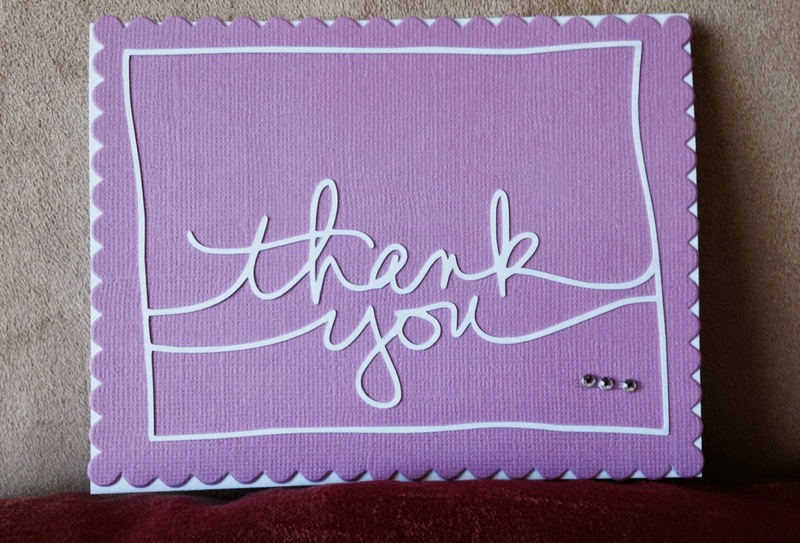 Annette used her design-know how to create the "thank you" word die cut on her Silhouette machine. The frame and wording look beautifully fluid against the pastel background. Great card Annette. Donna made this Dresden Plate quilt design card. Donna's first crafting love is quilting. 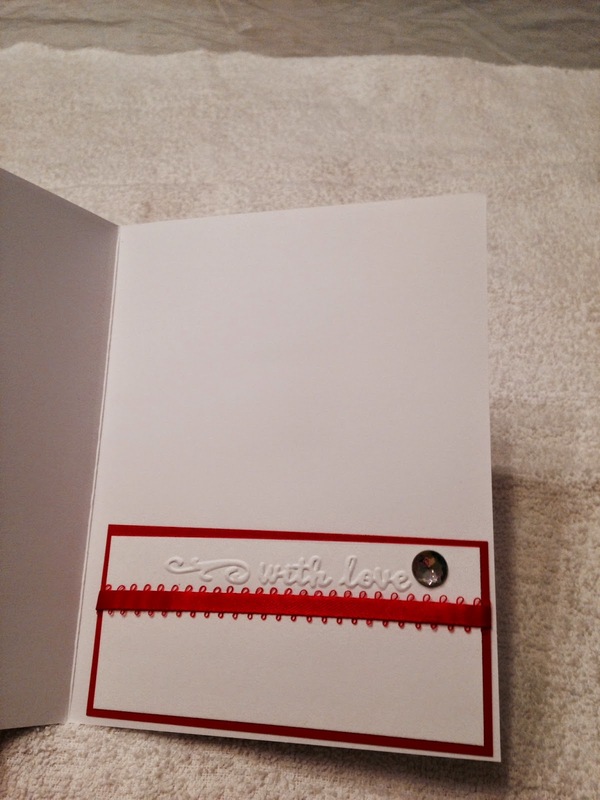 Therefore it is no surprise that she incorporated this love with her new found craft of cardmaking. 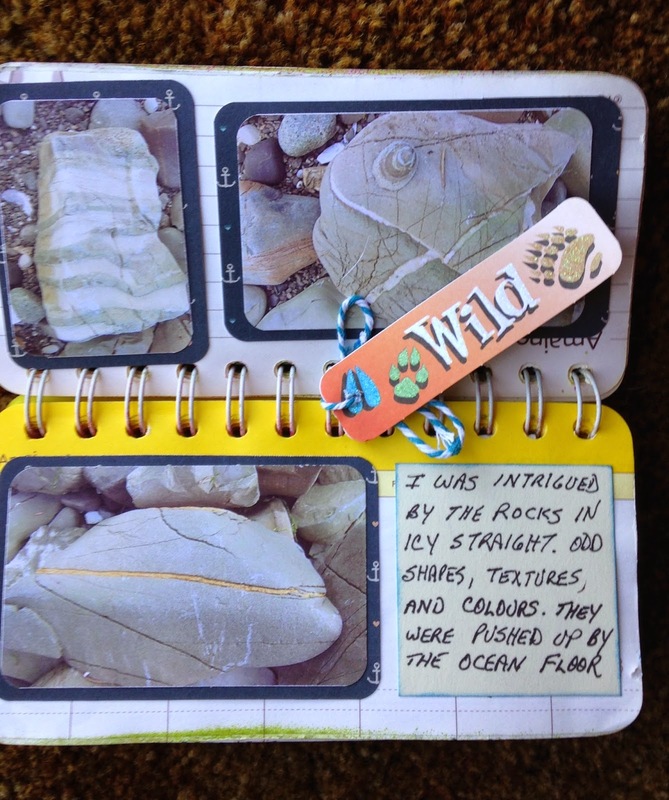 Donna used her Scan N Cut to cut out the elements of this unique card. Very sweet card Donna. 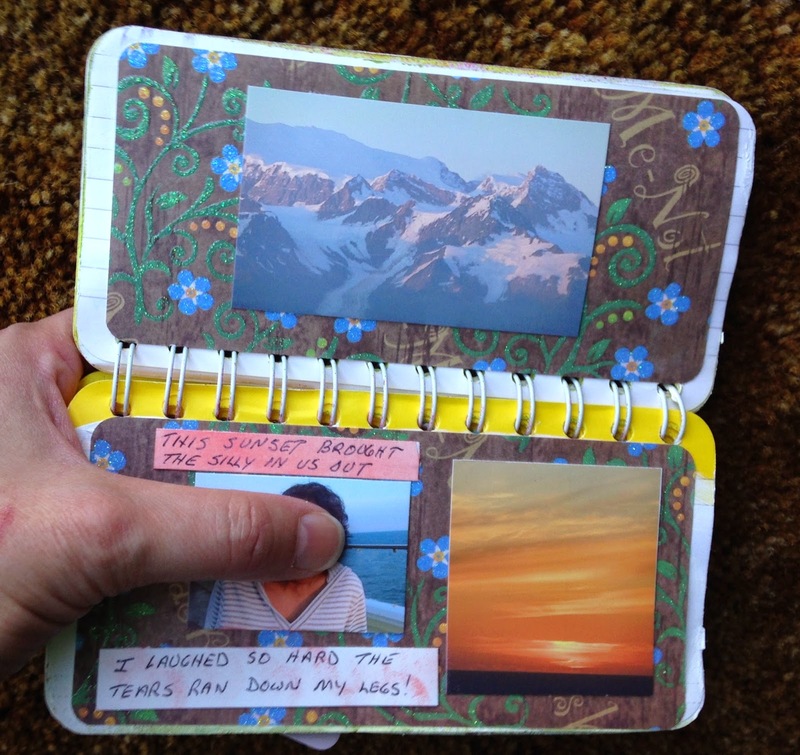 Barb made this delicate multi-paneled screen card. 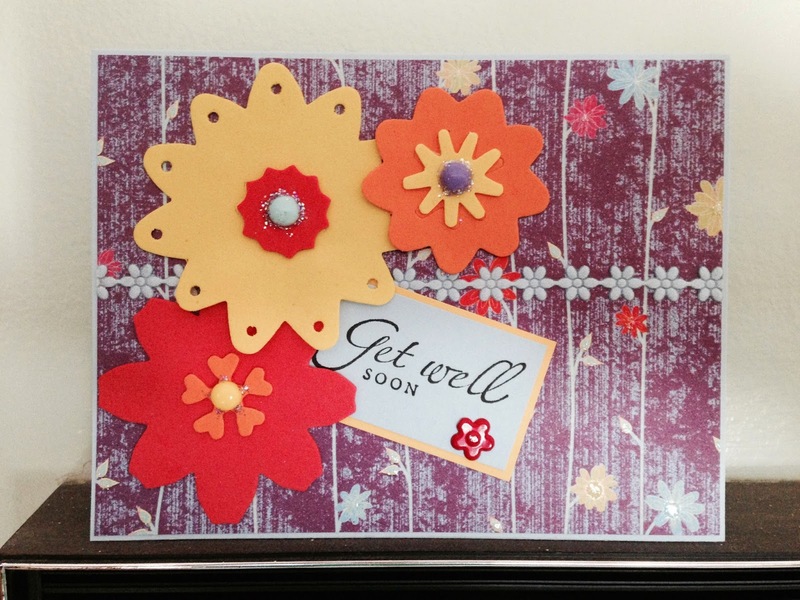 The punched border, colourful panels give this card an exotic look reminiscent of the Orient. Incredible card Barb. 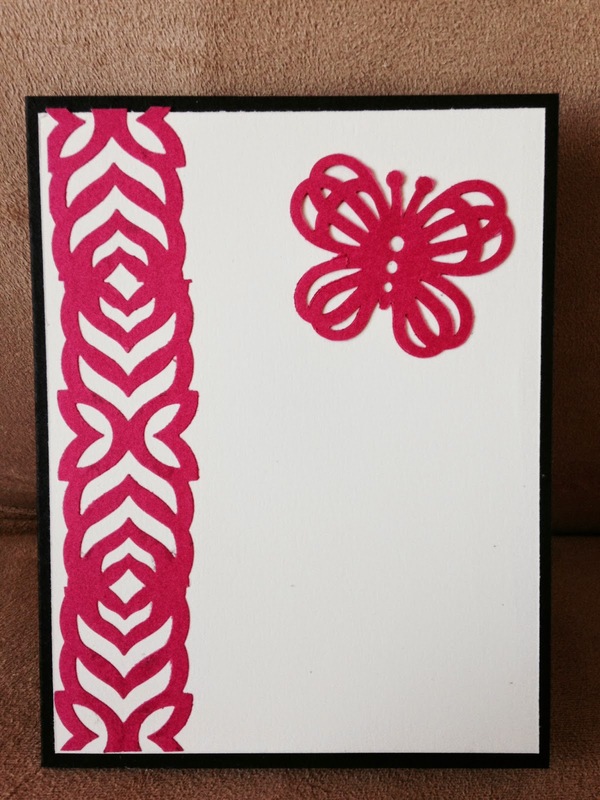 Karen made this hip Zentangle style card. 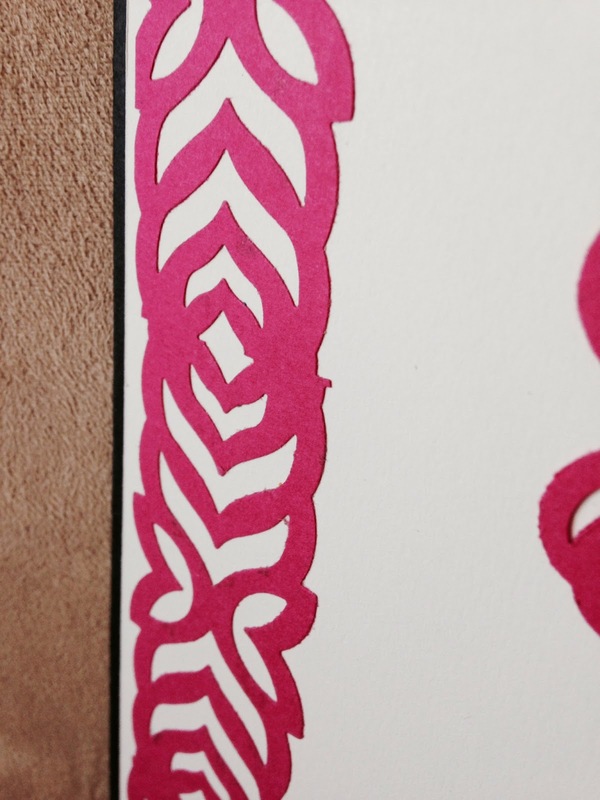 The doodling in the flowing dress stamp is so uber cool. What a very cool card. 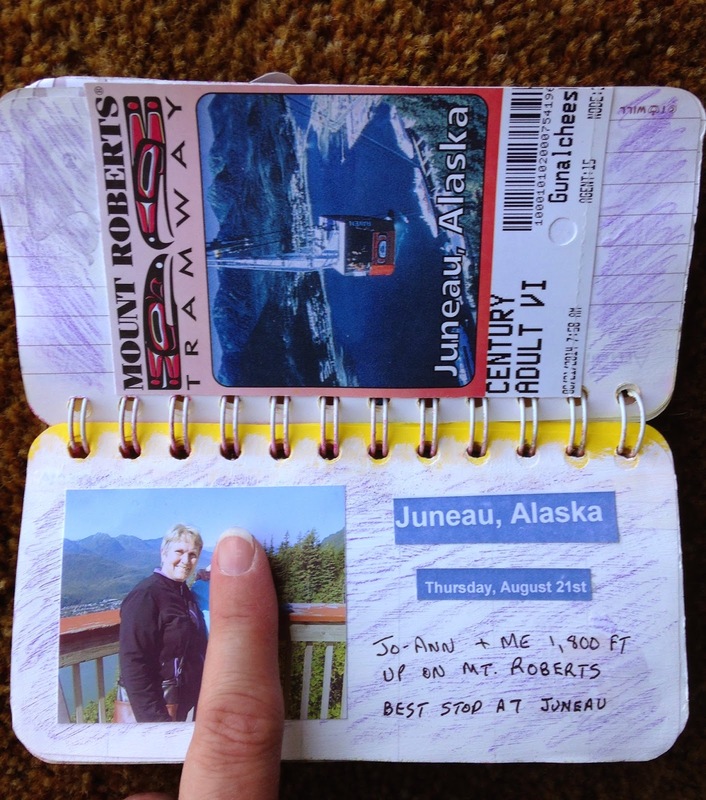 I received this card signed by all our Sailing with Scissors members with a thoughtful gift. What a wonderful bunch of people. This card has a special place in my craft room! Great card Karen.